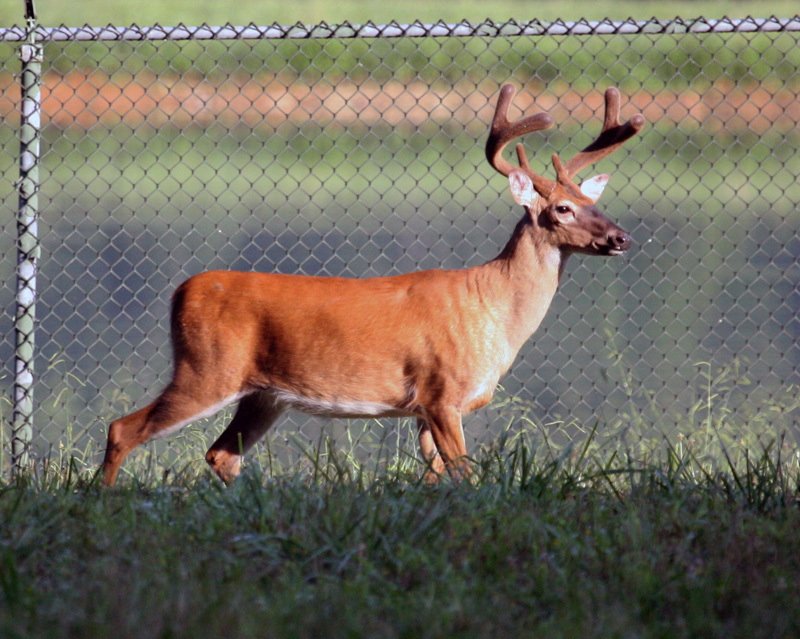 The White-tailed Deer (Odocoileus virginianus) is a large mammal that ranges from 75 to 250 pounds. It ranges from 53 to 71 inches in length, 31 to 39 inches tall at the shoulder, and it has a 6 to 12 inch tail. The White-tailed Deer is easily identified by the white hair on the underside and outer edges of its tail. When the deer is frightened, it raises its tail, thus communicating the danger to other deer. They range in color due to local and seasonal variation, but it is generally more grayish brown in the winter and more reddish brown in the summer. In addition to the white tail, this deer has white fur located in a band behind the nose, white hair under their chin, white underbellies, and white rings around their eyes. 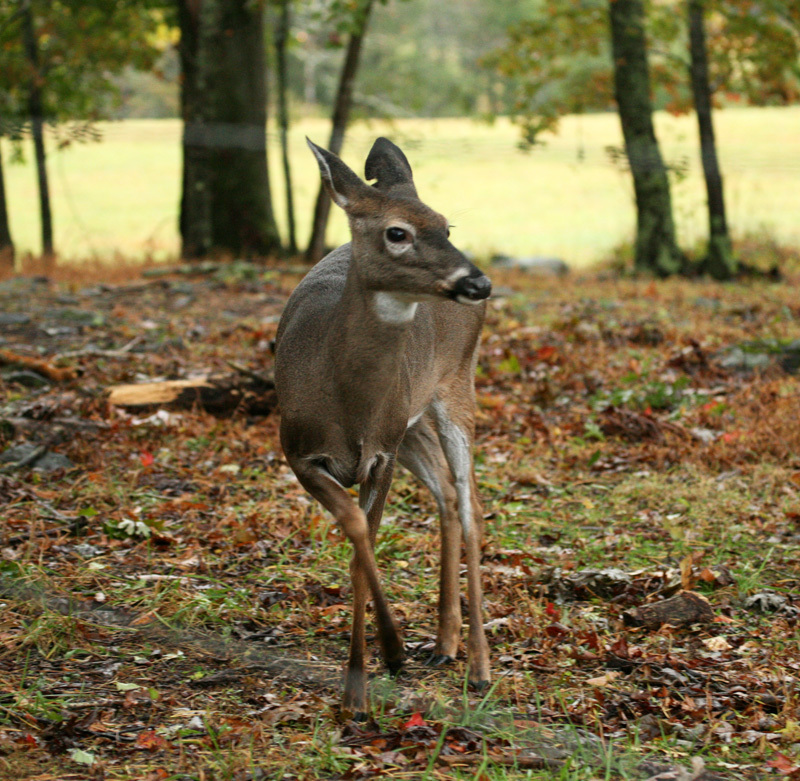 The White-tailed deer have scent glands between the two parts of the hoof on each foot, metatarsal glands on the outside of each hind leg, and a larger tarsal gland on the inside of each hind leg. The deer use the scent from these glands as means of communication between each other, and this scent becomes particularly strong during the rut (breeding season). Male White-tailed Deer (Bucks) have antlers that they shed between January and March. When they lose the antlers during the shed, trophy hunters like to look for and collect their shed antlers. When a particularly large buck, with a large rack, loses the antler on one side, the weight differential between the two sides of the deer's head is apparently unpleasant, and the deer will purposefully attempt to knock the antler off the other side of the head. This means, that if a large antler is found, then the other antler should also be found in close proximity to the first one. The antlers grow back again in April or May, when they are first encased in "velvet," which is the outer layer of the antlers as they are growing. The velvet is a living tissue, the texture of which resembles crushed velvet. As the antlers harden, the deer will begin to rub off the outer layer of velvet and will often eat this outer layer, which contains blood that is rich in minerals and nutrients. White-tailed deer generally mate in their second year, but some females may mate as early as 7 months of age. The females (Does) will usually come into heat in November for a short, 24-hour period. 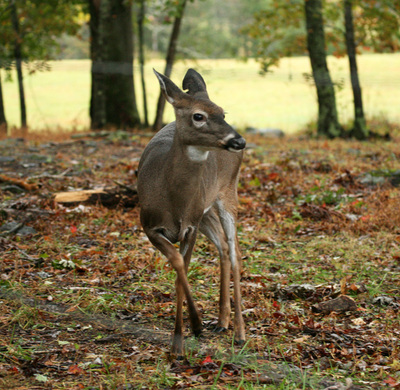 If a doe is not mated, they will come into a second estrus approximately 28 days later. Bucks are usually polygamous, but they sometimes form an attachment with a single doe whom they will stay with for several days or weeks until she comes into oestrus. Mating occurs from October to December. The gestation period is 6.5 months. The doe usually has one fawn during her first year of breeding, but in subsequent years, 2 fawns per litter are common. At birth, the fawns are able to walk, and can nibble on vegetation in just a few days. Male fawns will usually stay with their mother until they are one year of age, while females may stay with their mother for two years. 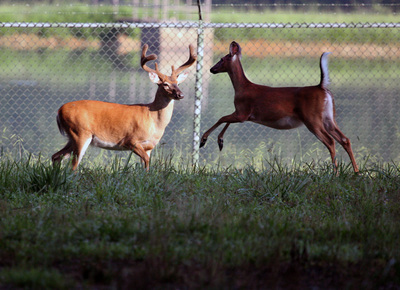 Most White-tailed deer only live 2 to 3 years, but they have been recorded to reach 20 years in the wild.